Anyone who follows me on instagram will know that Cantu are dominating my product shelf at the moment. Ever since i won 2 of the products in an instagram competition by Shannon aka UK Curly Girl. As i have said in a previous product review of this brand, this was one of the first brands that i used at the start of my journey and made a huge impact. However in my branching out and trying other brands, i forgot all about the effects of the Shea Butter range on my hair. Now i am 100% back on this brand and i am never leaving them again! In Shannon's competition i won the Leave-in Repair Cream, and the Curl activator. Then in my Treasure Tress box i received another repair cream, curling cream and the shampoo and conditioner. Posts on all of these products can be found on my page under product reviews if you haven't yet read them. I loved these so much that i dug out some of the other products that i still had from them as well as purchasing 2 more from the Shea butter for natural hair collection. "Dual action formula repairs split ends, conditions and elongates for stronger, shinier curls." OK, so this is one of the ones i already had in my collection. At the start of my journey when i was still learning about my hair, i had no idea how to see if i had any split ends, and so didn't really use this product much. Now that i know what healthy ends should look like, i know how to use this product. Directions: Spray throughout damp or dry hair as needed. Do not rinse. Style as usual. This product defiantly adds shine to my hair. I spray this on damp hair as the bottle directs, and scrunch the ends which have the most product applied. I have definitely noticed a change in this area. My ends (which at the moment need trimming badly) are definitely less noticeable once my hair has dried. The bottle is in two layers. One is a creamy colour and the other is a weaker watery colour. Shake this bottle well to combine the mixture for the results to work. I am so glad that i still have this product and pulled it out again. Now that i wear my hair down all the time, its nice to have a product in the collection which is aimed at the split ends rather than focusing on being moisturising to curls. Good hair starts at the root and ends at the tips. This product helps to maintain that. "Seals in moisture and tames frizz and fly aways revealing softer, smoother curls with just enough hold." What curly girl doesn't love a good coconut oil product? This is the newest one in the collection and so i haven't used it as much as the others. Like the split end mender, this one has a creamy colour to it (but the whole thing not just the top part). It is very light spray, but i don't feel like it sprays a big enough section of your hair, and you have to use quite a lot of it if you have long, thick hair like me. That being said, i do like the effects that this has on my hair. It is noticeably shinier than before using it and this is locked into my curls. When i saw that this said "hold mist" i expected it to dry almost like a gel and hold the curl that way, but it doesn't. It locks moisture in but without a gel like hold. Directions: Apply to damp hair section by section. Reapply to dry hair as needed for extra moisture and shine. "Softens and conditions hair for easy, tangle-free styling." When i began my journey and my hair was so hard to manage, this product here SAVED MY HAIR! It was like magic for getting out tangles and knots even if i hadn't combed my hair in a while. Now that my hair is not so bad, this is my finger detangling buddy. Easily in my top 2 for detangling hair. As well as leaving you with detangled and soft hair, it adds shine just like the other products by this brand and the smell is of course amazing. Anyone at the start of their journey and struggling with keeping hair tangle free, i suggest this product to you! I like to spray this into my hair wet or dry and leave for a few minutes before brushing. No more pain! Directions: Spray onto damp hair section by section. Comb through and style as usual. "Cantu Comeback Curl Next Day Curl Revitalizer will define, moisturise and restore your curls leaving them smooth, frizz-free and full of life." Instagram followers will know how i feel about this product. It is amazing! I was weary at first because Ive tried a few curl revitalizers in the past and they didn't do much to my hair, but this one is different. I tested this one out for a week to make my mind up on it. Usually i re wet my hair with a spray mixture on day 3 and 5. For this test week i didn't do this i just used this in the mornings and added a little gel. On day 7 my curls still looked and felt like day 2! I honestly don't know where this has been all my life. Directions: Spray on dry or damp hair, section by section to restore, refresh and revive curls, coils and waves. Reapply to dry hair as needed for additional moisture. We know i don't always stick to directions, so my styling advice on this one, is to spray it on dry hair while it is still in your bedtime pineapple, or in just two sections. You dont need to soak your hair, just a nice coating is enough. Then relax and watch your curls spring back up instantly! Easy to guess which is my favourite out of the 4, but i would recommend all of them to any curly girl, especially one at the start of his or her journey. Follow the brands on instagram and don't forget to like, subsrcibe and follow me too. 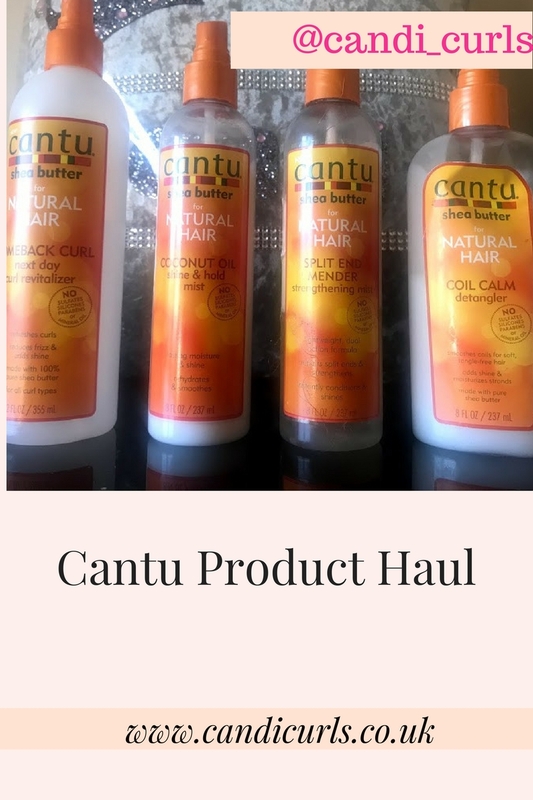 What is your favourite Cantu product? Scalp Massage| Do i need to be doing this?